I have an BGE XL today, and it's OK in size, but sometimes it feel small especially when I do babybackribs. But does the Kingman use that much more wood/fuel than a Wichita for example? I don't like that I need to mod a Wichita, but it's still ok. But if I just can start cooking that would be better. Turns out I can’t dm as I’m too new! Shipping to the UK from Lang is 550 GBP, that’s for a garden model, Yoder would be roughly the same, but the price would come down by 100gbp for each extra unit you order. I would say a Lang over a Yoder anyday. Here in Europe I have access to the cactus jack range which is made in the same factory as the rumo joes, or joes bbq smoker, built like tanks and their longhorn model is basically kingman I believe, the Germans love them! the pricing for the jacks is very competitive! I will contribute more on the forum more and reply to the DMs when I can. smoke_savage wrote: Turns out I can’t dm as I’m too new! Hi all, my first post here. I live in Sweden and im getting a Rumo Joe Championship longhorn this spring, very excited. Interesting fact is that Rumo got the license to produce the original oklahoma joe back in the day, and they are still going strong. A very nice looking pit i would say. 20'' with a huuuuge smoke stack, sometimes i think its too huge? Anyone got an opinon on that? Compared to the Wichitas stack that seems alot smaller. antinho wrote: A very nice looking pit i would say. 20'' with a huuuuge smoke stack, sometimes i think its too huge? Anyone got an opinon on that? I would venture to say you'd have more trouble with too small of stack than too large. You can always restrict the airflow using the exhaust damper but if the pit is designed right it should work fine wide open. That pit looks very similar to the Horizon 20" RD Marshal. Nice big wagon wheels. Looking forward to hearing how it works when you get it. Darkfix wrote: But does the Kingman use that much more wood/fuel than a Wichita for example? It looks like you asked Yoder Herb about Kingman wood usage over at the Yoder community forum but he wouldn't discuss it online. Did you give him a call? I know they have been trying to keep their conversations private lately because a customer mentioned he was told not to post comments on the forums, and Yoder is actively censoring customer feedback now. Do you guys think the high mounting position of the firebox is a more significant problem than the inlet vents? As it’s cause a lot of back drafting. 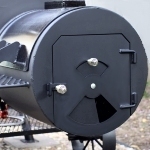 I’ve been looking at all the smokers on the market and the ones that seem to draw the best have low mounted fire boxes, that alone would be a deal breaker for me buying a smoker smoker now. smoke_savage wrote: Do you guys think the high mounting position of the firebox is a more significant problem than the inlet vents? As it’s cause a lot of back drafting. I definitely think the mounting position is a key factor for round fireboxes because it's more difficult to install a large vent low on those. Square fireboxes allow you to make huge slider vents at the very bottom, or multiple smaller round vents. My theory on the Yoders is they wanted the grill grate over the firebox to be high enough to make it comfortable for grilling so they moved the firebox up a little compared to the Horizons. If so, that was a bad trade-off. I'd rather have ultimate flow than a little convenience with a feature that isn't often used anyway. Joe did say the key to producing more smoke flavor was choking down the air flow, and that's probably why there is such a big lip with the ash deflector and the heat management plate combined.
" So what I'm doing there is choking that air flow down. I'm causing it to starve itself just a little bit so it produces the smoke more." My Wichita flows great now, but it produces less smoke because of the increased air flow. I can always throttle it down with the intake and exhaust dampers to make it behave like it did before, but then I'd be back to micro-managing the fire all day. I think the best solution for the factory Wichita is to follow Yoder's instructions and use it as a charcoal/wood hybrid. The charcoal solves the smoldering issues and the wood adds some smoke flavor. I simply do too many long cooks to think about buying that much charcoal. Wood splits are so much cheaper around here and they make the best tasting smoke flavor. But on this topic I don't understand why they can't/won't answer it in the forum. It was a simple question. I did contact Horizon again over Facebook, and they promised to come back.... But still nope!! Also contacted Ritch at Gatorpit, and there we can talk about customer support! Took 1-2days for a price quote with shipping, and he gladly answers my questions. Disclaimer: The LSG is my first offset - I started on a Traeger pellet grill, moved to a Classic Joe, then to a Big Joe, then to a WSM (needed more space), and now the LSG offset. I was fortunate in the fact that LSG had a 24X36 offset in stock, so it only took a little over a week to get it over to California. And when it arrived this past Friday I spent the second half of the day seasoning it and learning how to manage my fire (and I'm still learning). I think with a few more cooks I should have this thing dialed, but for what it's worth I'll walk you through my first cook of 3x baby back ribs and pork belly (Malcom Reed recipe) from Costco. I used about a chimney and a half of Kingsford charcoal as my base, and I lit it using the optional gas attachment and not the actual chimney. It took about 30 minutes for the coals to get white and then I added some Cattlemen's pecan splits, two to be exact. With the intake and stack vents wide open I was able to get my temps in the 250-280 range by adding a couple of splits at a time. If any of you have used Cattlemens' the splits are fairly small which I think helps when trying to learn a new grill. When the smoker hit the 250 mark I'd add two more splits, wait about three to five minutes with the door wide open so the splits could get rolling and that was about it. Rinse and repeat every about every 45 minutes or so. 1. It was very windy during my cook, it even knocked down a couple of my patio umbrella's that were tucked away. Not once did I have to move my smoker even though the winds were shifting all day. 2. The square firebox on this thing is huge, I might have one of my kids actually live it in. Hah! Seriously though - I did not have any smoke come out of the sliding vent throughout the entire cook, even when the big gusts came rolling through. 3. Again - all vents were wide open. I saw a video online that showed it's best to control your temps by controlling your fuel, it makes for a cleaner fire. The thought being choking down the fire and could make it smolder, producing bad smoke. <-- Can someone tell me if this is a best practice? 4. I did not add any additional charcoal throughout my cook, only when I initially started my fire. The splits did the rest. 5. For it being my first cook on a offset the food came out pretty good! I think I went a little too long (by about 20-30mins) but there was a different flavor profile than what I typically got with my WSM and Big Joe. The meat actually tasted a bit sweeter, even though I didn't change my prep/recipe at all. Maybe it was the pecan wood? Since I'm so new to the offset cooker crew I'm not sure if my way of cooking is the "right way" by any means, I'm just sharing my experience with you all so that if anyone thinks I should make any changes, or alter the way I am cooking, or change a setting on my grill, etc... they can post it on this here forum. Darkfix wrote: But on this topic I don't understand why they can't/won't answer it in the forum. It was a simple question. That forum has been pretty quiet since I stopped posting there. I don't know if it's due to the season (winter) or what. My guess is they're still doing damage control after several years of customer complaints about smoldering fires since the introduction of the heat management plate. Taking problematic conversations offline allows them to spin their answers any way they want (let's not forget they deleted 113 posts they didn't like). Transparency is a noble goal, but it's risky when you have flaws to hide because public conversations have a way of living in the cloud forever. Forum conversations that might deter future customers are bad for Yoder, so in that regard Herb is doing the right thing by keeping those conversations confidential. Last edited by slamkeys on Sun Mar 04, 2018 12:37 am, edited 1 time in total. Taking problematic conversations offline allows them to spin their answers any way they want (let's not forget they deleted 133 posts they didn't like). Transparency is a noble goal, but it's risky when you have flaws to hide because public conversations have a way of living in the cloud forever. Forum conversations that might deter future customers are bad for Yoder, so in that regard Herb is doing the right thing by keeping those conversations confidential. I would pulled the trigger if it wasn't for I'm out of work next month, and don't have a new work yet. madsmoke408 wrote: 3. Again - all vents were wide open. I saw a video online that showed it's best to control your temps by controlling your fuel, it makes for a cleaner fire. The thought being choking down the fire and could make it smolder, producing bad smoke. <-- Can someone tell me if this is a best practice? As one who's owned three stick burners and currently an LSG devotee I can assure you that is the best practice. Fiddling with dampers should be a temporary solution to the user not paying attention. Too much wood and a run-away pit - sure, slow the airflow down to regain control and learn from that. I routinely run both ends wide open controlling temps with fire size. Yes, you may have to add wood (smaller pieces) more often but your temp spikes are pretty much eliminated. I too have been following this thread and other similar ones. With a few exceptions, I don't know why anyone would consider a pit that has such documented issues when there are many more that simply WORK. Slamskey's efforts are admirable but BBQ is tough enough without fighting a poor performing pit.